In business, time is money. In the case of a certain major food processor, the company determined that they needed to find a more time-efficient way to track information from their plant floor. With eight major processing facilities at different locations, they have a lot of data to track. In order to ensure the quality of their products, thousands of data points must be tracked including cooking temperatures, water levels, and product quotas. In the past the company spent a lot of valuable time recording information by hand. However, to keep up in the fast-paced food processing industry they needed to find a way to save time and money. They needed information from the plant floor in real-time. They needed the power to use that information to ensure product quality and increased productivity. They needed a full-featured HMI (human machine interface) and SCADA (supervisory control and data acquisition) system to connect all their plants together. Ignition gives plant management the ability to see the whole plant floor at once. Local HMI screens are easily mirrored using the Ignition Designer. They wanted to find the right HMI/SCADA solution to fit their needs, so they asked Kasa Industrial Controls for help. Kasa is a leader in the industrial controls industry, helping companies worldwide in developing and implementing top-notch control systems. After evaluating their new client's needs, Kasa told them about Ignition. 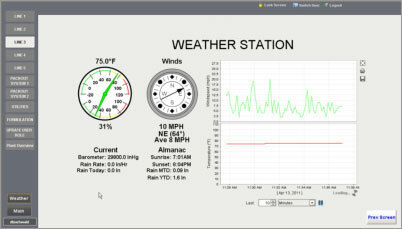 Ignition is the database-centric, web-based HMI/SCADA software package from Inductive Automation. Kasa's client loved what they heard about it. Garrick Reichert, senior control engineer for Kasa Industrial Controls, explained: "They really liked what Ignition had to offer; the simple pricing, its flexibility and compatibility – these were all major factors. Ignition pretty much sold itself, and they asked us to help them get started." Each of the client’s food processing plants requires the use of several thousand data points to effectively supervise the facility. These data points come from numerous PLC tags as well as newly installed sensors that monitor everything from freezer temperatures to water pressure. Tracking this information at multiple plants compounds the amount of data that needs to be collected on a constant basis. With Ignition, collecting this amount of data is no problem. Unlimited data points allow for as many tags as needed. Each plant is set up with a virtual gateway server that launches Ignition clients and collects data. Since Ignition is licensed by the server instead of by the seat, it's possible to launch an unlimited amount of Ignition clients. Reichert explains how this simple pricing model affected the project: "Originally our customer had only planned on getting a couple of plants up and running with SCADA software. With the money they saved going with Ignition, they got most of their plants running it." Ignition is database centric, making it easy to store all data in a central location. Using a store-and-forward method, all the information from the plant floor is sent to a central database that is easily accessible by each gateway. This means that each plant has access to the real-time data for that facility, and as Reichert says, they can do more than that. "Each plant can instantly switch over to see what's going on in the other plants,” he said. “It's easy to do; the ability is actually built right into Ignition." One key factor in Kasa's client’s choice of HMI/SCADA software was Ignition's ability to work well with a vertical software package specific to the food processing industry. 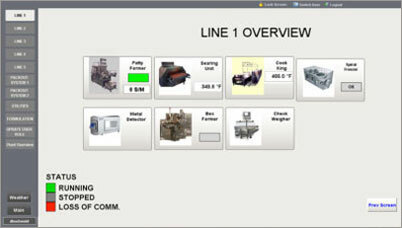 Heath Roker, project manager for Kasa Industrial Controls, explained why the software was so important: "The vertical software the client employs is used to track quality assurance. It records and analyzes data from the plant floor to ensure that food quality meets FDA regulations." Ignition gathers all the data that the vertical software needs and writes it to an intermediate database. 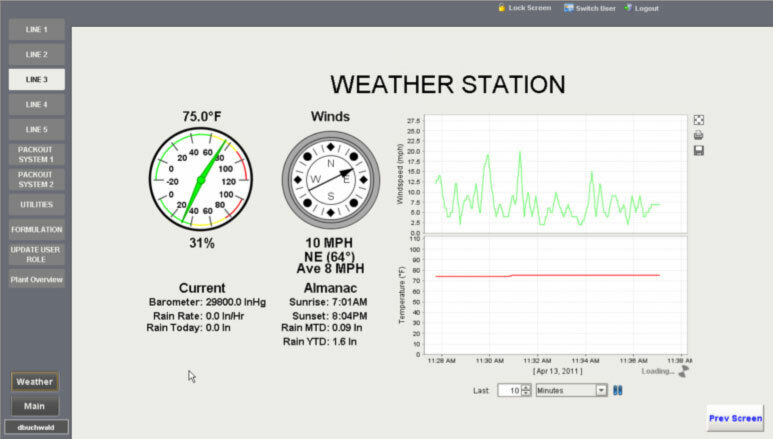 From there the vertical software grabs the updated data and analyzes it to generate reports and alerts. The setup was straight forward, and the system works seamlessly to deliver exactly what the client wanted. Ignition uses up-to-date, proven coding languages and programing standards to make it easily compatible with just about any software. Roker reported how this helped in integrating Ignition at each facility. "Each plant was set up differently, but Ignition's flexibility made it easy for us to add the additional equipment and screens the client needed," he said. There is likely no better measure of time savings and productivity increases than looking at how Ignition has positively affected the work flow of the plant’s employees. Jay Aurand is the project engineer for Kasa Industrial Controls, who was responsible for getting the plant floor PLCs connected up with Ignition. He had to work closely with maintenance managers to ensure that the new Ignition control system met their needs. "The maintenance supervisor wanted to see exactly the same data on his screen that he would see if he walked around the plant floor," Aurand explained. To make this possible, Aurand worked with Kasa System Developer Garrick Reichert to create the necessary HMI screens in the Ignition designer. "After a little training, the Ignition Designer was easy to use and very powerful." Reichert continued, "We were easily able to mirror the HMI screens that plant employees are familiar with." Hundreds of HMI screens were created to mirror the local HMI of each machine, on each line, and in each plant. Through Ignition the entire plant floor was visible on a single terminal. This powerful functionality gave personnel total visibility over all the plants. One particular maintenance supervisor expressed his satisfaction to Jay Aurand: "The supervisor loves that now he can check the whole plant without getting up from this desk.” The supervisor went on to explain to Aurand exactly how much time and effort that kind of easy access to data saves him every day. "He told me that Ignition has saved him 30 minutes, five hand washings, and four smock changes, every time he needs to check the floor," Aurand said. The customer is thrilled with the results of Kasa's work and the amazing power and possibilities that Ignition now gives them. Roker said that the client has greatly benefited by using Ignition because he saw it first-hand. "Before Ignition they had no automatic tracking or connection to the plant floor,” Roker said. “Now Ignition connects all the plants together and tracks everything for them. There is no doubt that Ignition has saved them a significant amount of time and money."